Grand Daisy Press, 9780984860814, 133pp. The Adventure Continues... With fourth grade finally winding down, 10-year-old Nathan Rockledge is looking forward to a fun and relaxing summer at home with his friends. That is, until his mom decides he has to go to overnight camp with his annoying older sister. When his best friend, Tommy, decides to tag along, Nathan thinks maybe his summer won't actually be so bad. After all, he does get to be away from his mom's awful cooking for an entire six weeks. 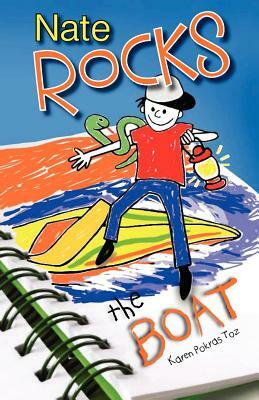 Amongst Color War competitions, a flaky counselor, and a bully named "No-Neck," Nathan turns to his trusty sketchpad, transforming himself into Nate Rocks: 10-year-old extraordinaire. His speedboat ready for action, Nate saves the day time and again from the perils of floods, snakes, ghosts, and even the most wanted criminals. Join Nathan, Tommy, Abby, and a whole new cast of characters as Nate Rocks once again proves nothing can hold him back. For more on the Nate Rocks Books, visit www.karentoz.com.